Partnership Assurance – Post Pensions Plunge Position! Yesterday the budget announced the removal of the requirement to buy an annuity for those with defined contribution pensions. As annuities are horrible value and make up practically all Partnership Assurance’s business the reaction was, severe. The share fell from 300 in the morning to close at 143. Firstly looking at earnings. I think it very likely that annuity sales will fall severely, particularly the impaired annuities – for those who are likely to die earlier offered by Partnership. If this does happen I think there are enough supports to Partnership’s valuation to ensure it is attractive at this level. I am assuming a 50% fall in new business – due to the change in rule – this is based on a table in the prelims. This suggests 50% of PA’s (undiscounted) liabilities are under 10 years in duration and 50% over. If (say) you only have 7/8 years to live your longevity risk is limited so you can probably manage without an annuity. If 10 years plus – less so. These are highly arguable assumptions, but not unreasonable. I am simply flatlining the Inforce policies and returns from surplus assets – also assuming interest costs stay the same. Multiplying my 2015 earnings estimate by 13 – gives equity value of £660m against a closing MCAP of 572. In addition to this PA has £173m surplus economic capital. Of course not all this can be distributed, but in a world where new business drastically decreases more of it could be – say £100m – giving a total value of £760m…. If one assumes all new business goes away and historic returns flatline this gives an equity value of £315m – plus £100m surplus capital – a halving of the current share price. 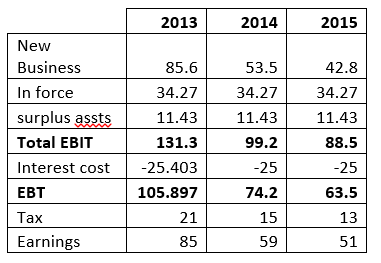 I would argue EBIT should increase in such circumstances as all that would need to be done is service the existing stock of liabilities / assets, leading to higher returns and a much more minimal cost base. Looking at the 2012 figures (to get away from IPO Costs) the administration cost of the company was £73.2m. If we halve this we get to a 2015 EBIT of £80m, earnings of £44m and a £572m MCAP. In reality I dont think any of these things will happen. As time goes on the cohort of people with substantial DC pensions will increase – right now the retiring cohort (age 60ish) started work in 1973. I have struggled to get figures on this but most of them probably spent most of their working lives in a DB pension. As time goes on this proportion will gradually decrease. Further to this – only 20% of those with DC pots shop around for their annuity. As the firm points out if this proportion increases so does their market. With the end of automatic annuity purchase more people are likely to think about what they do with their money – so again this could be a positive for Partnership. As at yesterday’s close the market cap was £572m. The company had a book value (based off existing business) (adjusted to exclude intangibles) of £456m – one would expect some premium to book – so this suggests it must have been heavily valued previously on its growth prospects… I suspect this severely limits the downside. Lots of broker announcements this morning – most lowering their target from 350 to about the current share price – again suggests downside is limited – and hopefully when the market twigs the value of the existing assets up we go! Here in Canada and in US there is little or no market availability of inflation-indexed life annuities at retirement. Is the UK market going to survive the 2014 budget removal of their mandatory purchase? Firstly I should point out very few annuities are now inflation linked (foolish for people to purchase these really…). 1. They will talk to advisers – these advisers are so tightly regulated they will probably have to recommend annuities purchase – even though it isnt a great idea. We might have to rethink ‘foolish for people to purchase’ inflation-indexed life annuities. On an emotional level the price of inflation-indexed income for life looks outrageously high. That’s the message. Purchasing a non-inflation-linked life annuity is shooting the messenger. Forgive me for falling back on personal anecdotal evidence, but my dad is trotting around briskly at age 91 after 31 years of retirement. Longer than he worked – not unusual. With linker gilts yielding close to zero, the math is easy. An indexed life annuity paying less than 3% per year is about right. What I meant is that it is foolish to buy any sort of annuity, particularly non index linked. With so much govt / private debt out there and quantitative easing its likely the easiest option will be followed to solve this problem – inflation.